The Trade Manager Pro EA is a MetaTrader Expert Advisor that performs position management for you avoiding human errors and enhancing your trading activity. What happens once I have taken a trade? It places the initial stop loss and take profit orders. Get a free-ride as soon as possible and assure capital preservation. By default, this is accomplished by closing 50% of the trade when the breakeven point is reached, which is 5 pips by default. This means that if you get stopped out in the future, you will have lost nothing (optional). The trailing stop starts operating after the breakeven is performed. It trails the stop loss until stopped out, letting profits run. How does the trailing stop work? 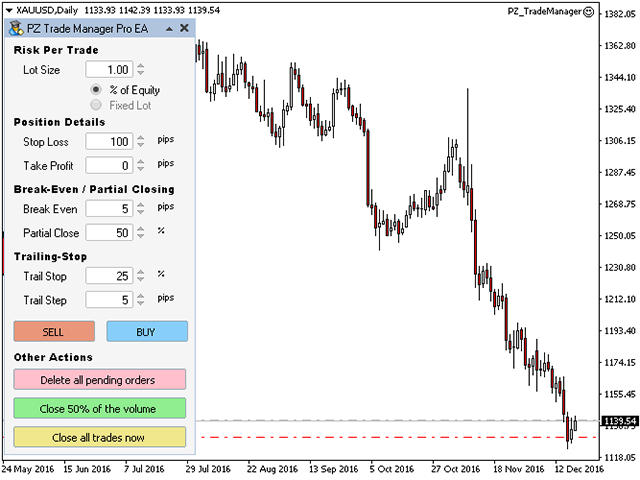 The trailing stop is expressed as a percentage of the profits of the trade being managed. 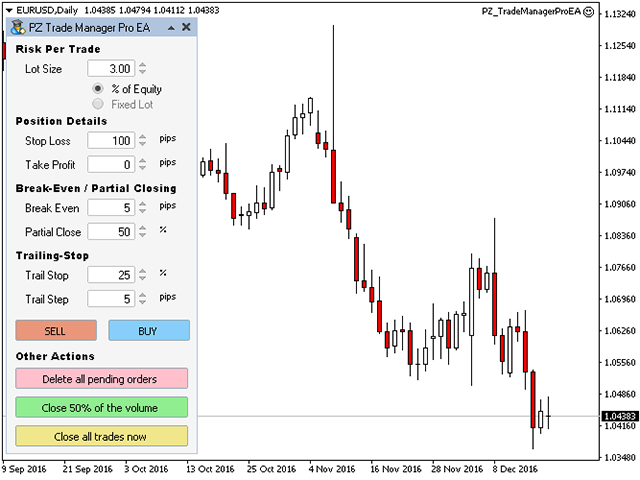 For example, with a 25% trailing stop value, the actual trailing stop will be 25 pips when the trade is 100 pips in profit, but 250 pips when the trade is 1,000 pips in profit. This allows the profits to run, and the trailing stop remains proportional to the trade profit.